Brilliant AV was aided by the support materials and turnkey design approach of Rayva's home theater solutions to win a client bid that it had initially lost. Proving that timing is everything, when Costa Mesa, Calif.-based Brilliant AV hosted the home theater company Rayva at its facilities, Brilliant AV had just been declined by a client after submitting a bid. After seeing Rayva's presentation, Steve Stary, vice president of sales at Brilliant AV, was convinced that Rayva's turnkey home theater packages were exactly in line with what his Newport Beach client wanted in a home theater. "The contractor was set on using his guy and due to the lack of differentiation between us and him in the client's mind, we lost the job," comments Stary. "The client said, 'I like you Steve, but every tech guy I talk to is telling me something different, so I'm just going to have to trust my contractor on this one.'" Stary showed the homeowner the materials Rayva left with him. After educating himself with the Rayva materials, the homeowner called the other A/V firm and asked pointed questions related to speaker placement and other design elements that the other A/V company could not specifically answer. Stary says that through the help of Rayva, his company was ultimately able to win the client over by providing detailed information that answered the homeowner's questions so he could make an informed decision. "If the client was going to spend money, he wanted to know for sure that he was going to get results," notes Stary. "Neither the A/V guy nor I could give him the confidence he needed without taking a design deposit and spending the time required to prepare a design. It was about way more than, 'just trust me.' Rayva helped us give him that confidence." According to Rayva, part of its business model is designed to aid dealers in communicating with homeowners to help bridge the knowledge gap that sometimes exists between dealers and consumers. "The lighting design really makes this room. There is no trim on any of the fixtures between the beams in the vaulted ceilings." Stary admits that prior to working with Rayva they would recommend potential clients check out home theaters on the website Houzz. Working with Rayva, Stary says the client meeting turned into a conversation about extending the theater into other rooms of the home. In the case of this particular client, the 50-foot x 30-foot house is laid out as a big great room and kitchen, with the theater residing off the great room. To meet the client's expectations after winning the bid, Brilliant AV employed DSP-based Sonance speakers mounted flush into the ceiling, and Sonance Sonarray speakers spread throughout the patio, sunken barbecue, pool, and courtyard. Focusing on the even distribution of sound, Stary placed an emphasis on the number of speakers used and the installation location of the speakers. "In the end the client had to buy more speakers, but he can actually use them without having to crank them or argue with his neighbors," Stary comments. Brilliant AV integrated Sonos to serve as the foundation of the installation's whole-house audio capabilities, and the company installed a Control4 control and automation system to control everything. The Control4 system interfaces with a Lutron lighting system that includes HomeWorks and Lutron EcoSystem light fixtures, which provides a control method for LEDs that address individual fixtures and allows for system feedback from the LED drivers. "The lighting design really makes this room. There is no trim on any of the fixtures between the beams in the vaulted ceilings," explains Stary. "Because they are EcoSystem addressable, they can dim down to one percent. There are also recessed addressable fixtures for artwork, tabletops and spots. It is beautiful." "It's mind blowing how fantastic the theater sounds. It sounds way better than I ever thought it was going to and better than I've ever heard the KEF speakers sound. " 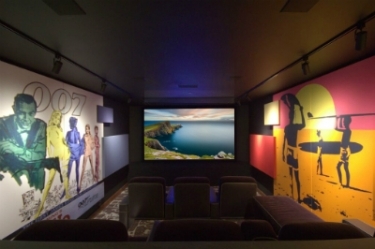 In the home theater, the client wanted a modern look and chose the "non-traditional" Rayva "Scenes" theater. Brilliant AV also installed a 9.4.2 object-based home theater using electronics from Integra and KEF loudspeakers. "It's mind blowing how fantastic the theater sounds. It sounds way better than I ever thought it was going to and better than I've ever heard the KEF speakers sound," boasts Stary. "I have used these speakers many times and knew they would sound good, but they were tighter, clearer and more detailed in this environment." Handling the video side of the home theater, Brilliant chose to use a 4K Sony projector and an acoustically transparent Screen Innovations (SI) 16:9 screen. Keeping an eye on the evolving home video market, Stary admits the video portion of the installation was designed to accommodate future technologies that are looming on the horizon. "We know in five years the homeowner will probably want to upgrade to an 8K projector, so we didn't want to spend a lot of money on the video system," states Stary. "But the video quality is spectacular, we have 4K, and the brightness and screen size are perfect for the room."